Boothite: Mineral information, data and localities. Light blue; light blue in transmitted light. After Edward Booth (1857–1917) chemist at the University of California. This mineral, fully hydrated copper sulphate, is very rare. 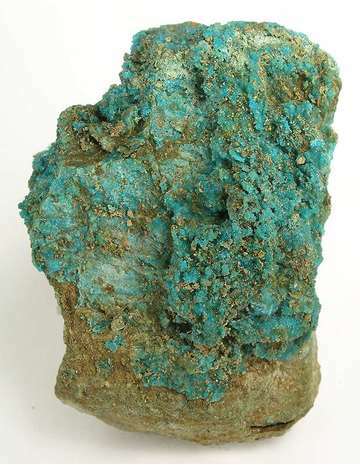 The partially hydrated copper sulphate mineral, chalcanthite, is much more common. Silky or pearly luster on fibrous material. Crystals rare. Commonly massive with crystalline or fibrous structure. Ferroan Boothite An iron-rich boothite. 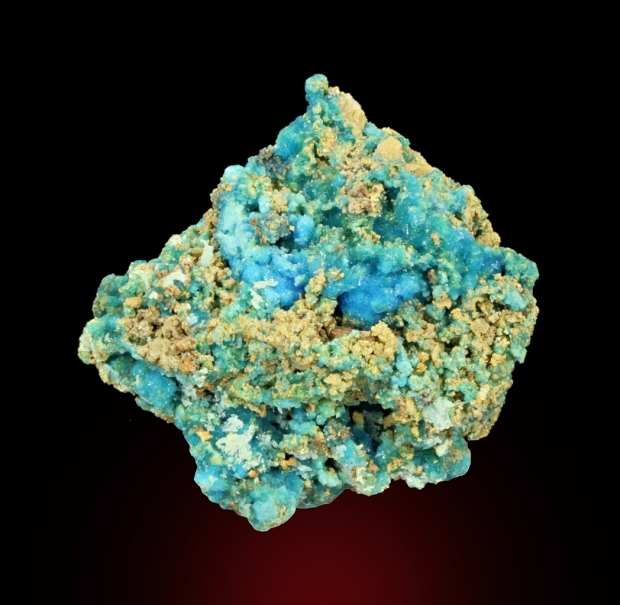 Originally reported from Salvadora Mine, Calama, El Loa Province, Antofagasta Region, Chile. 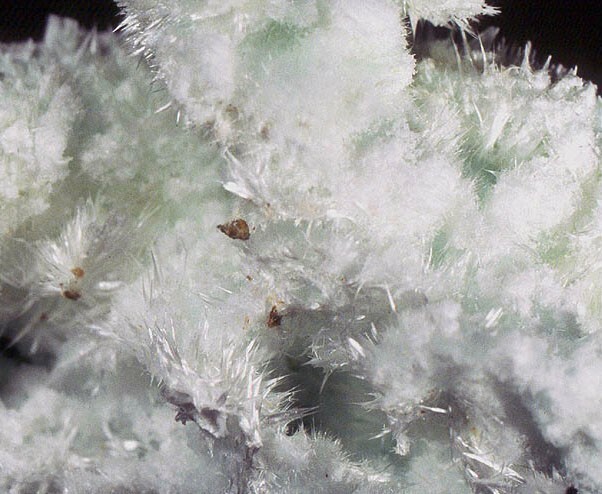 Zincmelanterite (Zn,Cu,Fe)SO4 · 7H2O Mon. Arseniosiderite 2 photos of Boothite associated with Arseniosiderite on mindat.org. Pyrite 1 photo of Boothite associated with Pyrite on mindat.org. 29.6.10.3 Zincmelanterite (Zn,Cu,Fe)SO4 · 7H2O Mon. Schaller (1904) American Journal of Science: 17: 192. Lacroix, A. (1910) Minéralogie de la France et des ses colonies, Paris. 5 volumes: vol. 4: 227. Larsen, E.S. and Berman, H. (1934) The Microscopic Determination of the Nonopaque Minerals, Second edition, USGS Bulletin 848: 150. Palache, Charles, Harry Berman & Clifford Frondel (1951), The System of Mineralogy of James Dwight Dana and Edward Salisbury Dana Yale University 1837-1892, Seventh edition, Volume II: 504-505. Leverett, P., McKinnon, A.R., and Williams, P.A. (2004) New data for boothite, CuSO4·7H2O, from Burranga, New South Wales. Australian Journal of Mineralogy: 10: 3-6. Leverett, P., McKinnon, A.R. & Williams, P.A. (2004) - New data for Boothite, CuSO4.7H2O, from Burraga, New South Wales.- Australian Journal of Mineralogy, vol.10, n°1. ; Leverett, P., & Williams, P. A. (2007). Unusual post-mining sulfates from the Peelwood and Lloyd mines, New South Wales, and a comment on wattevilleite. Australian Journal of Mineralogy. Scacchi (1872) Acc. Napoli, Rendus: 211 (as cupromagnesite); American Mineralogist (1927): 12: 14-19.
ⓘ Attramadalen Mines (Atramdal) ? Grant, Raymond W., Richard A. Bideaux & Sidney A. Williams (2006), Minerals Added to the Arizona List 1995 to 2005: 2.
ⓘ Grand Reef Mine (Aravaipa Mine; Lead Jewel; Joe Rubal Mine; Vivian Mine; Calistoga Mining & Development Co. Mine; Bringham Silver and Lead Mine) ? Palache, C., Berman, H., & Frondel, C. (1951), The System of Mineralogy of James Dwight Dana and Edward Salisbury Dana, Yale University 1837-1892, Volume II: 505; Schaller, Waldemar Theodore (1903a), Minerals from Leona Heights, Alameda County, California: University of California, Department of Geological Sciences Bulletin: 3: 207; Schaller, Waldemar Theodore (1905b), Mineralogical notes: USGS Bulletin 262: 123; Pemberton, H. Earl (1983), Minerals of California; Van Nostrand Reinholt Press: 296.; Anthony R. Kampf & FM Locality Index Committee (1989) California Locality Index. Mineralogical Record, 20:129-142. Palache, C., Berman, H., & Frondel, C. (1951), The System of Mineralogy of James Dwight Dana and Edward Salisbury Dana, Yale University 1837-1892, Volume II: 505. Schaller, Waldemar Theodore (1904), Notes on some California minerals: American Journal of Science, 4th. Series: 17: 191-194; Schaller, Waldemar Theodore (1905b), Mineralogical notes: USGS Bulletin 262: 122; Pemberton, H. Earl (1983), Minerals of California; Van Nostrand Reinholt Press: 297.; Schaller, Waldemar Theodore (1904), Notes on some California minerals: American Journal of Science, 4th. Series: 17: 192; Schaller, Waldemar Theodore (1905b), Mineralogical notes: USGS Bulletin 262: 122; Murdoch, Joseph & Robert W. Webb (1966), Minerals of California, Centennial Volume (1866-1966): California Division Mines & Geology Bulletin 189: 108. Murdoch, Joseph & Robert W. Webb (1966), Minerals of California, Centennial Volume (1866-1966): California Division Mines & Geology Bulletin 189: 108.
ⓘ Davis Pyrite Mine (Davis Mine; Davis Sulfur Ore Mine) ?